The first test string at Pole of what would evolve into the AMANDA and IceCube neutrino telescopes was installed during the summer of 1991-92 (above, some of the photomultiplier tubes (PMTs) are being prepared to be lowered into the hole). These tubes would later evolve into the AMANDA optical modules (OMs) and IceCube digital optical modules (DOMs). 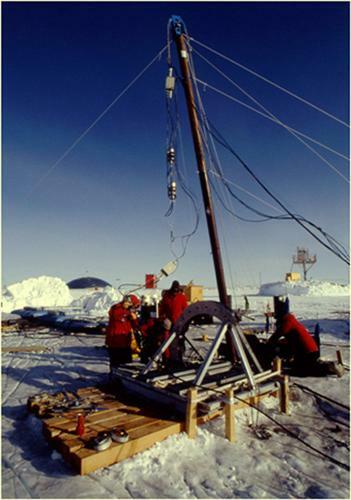 Actually, this wasn't the first concept test of detector strings in ice holes...that had been conducted in August 1990 at the GISP-2 drilling site on the Greenland icecap. The concept of neutrino telescopes such as this, earlier known as muon detectors, was proposed by two physicists in 1960. One was Cornell physicist Kenneth Greisen, who experimented with detectors in various places around campus and 2000 feet underground in a salt mine under Cayuga Lake. The other was the Russian physicist Moiseĭ Aleksandrovich Markov, who proposed installing large-scale detector arrays under water and ice. Markov proposed using optical sensors to detect the light (Cherenkov radiation) produced by high energy particles passing through water. The first major practical test of this concept was the DUMAND (Deep Underwater Muon And Neutrino Detector) project conducted in by an international consortium which included the University of Wisconsin. The Department of Energy (DOE) funded project operated between 1976 and 1995...its final phases put optical modules (some of which evolved into the ones used in AMANDA) in 15,000 feet of water offshore of Keahole Point, Hawaii. Anyway...from all of that background, the idea was developed that something similar "could" be done in the Antarctic. If you look closely at the above photo, you will note that this detector string was NOT being deployed in the dark sector (which was still being developed at the time), but southeast of the dome and Skylab. Here's the sledful of hot water heaters...multiply this a few times and put them in modules, and you have a significant part of the IceCube drill camp infrastructure. 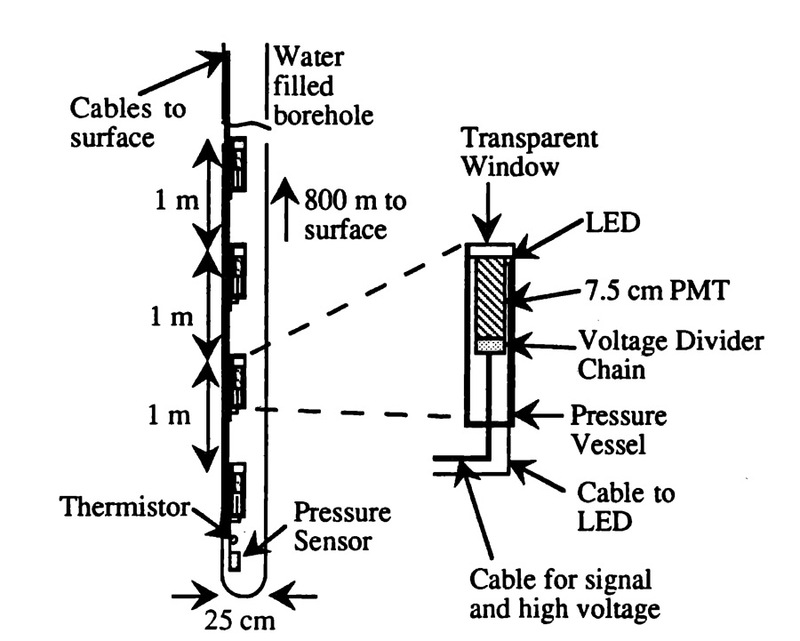 At right is a diagram of the detector string (yes, there were exactly FOUR PMT's. The string was lowered into a 25 cm diameter hole 800 m deep. 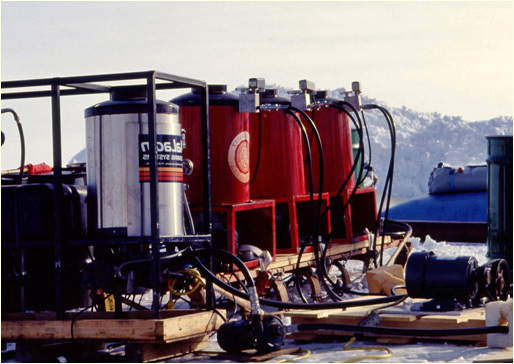 The PMTs were 7.5 cm in diameter and enclosed in 10 cm pressure housings, 1 m apart And unlike the AMANDA modules (and DUMAND) modules), these, similar to the PMTs tested in Greenland in 1990, looked upward, as the primary purpose of this test experiment was to measure the quality of the ice as a Cherenkov radiator, so that the design of the AMANDA detection system could be refined. Unlike the Greenland test which used a non-freezing fluid (so the PMT's could be removed), this drill hole was filled to the surface with water which was allowed to freeze. By comparison, the AMANDA project used spherical modules quite similar to the one depicted at left, which was one of the types used by the DUMAND project. These were 17" in diameter. 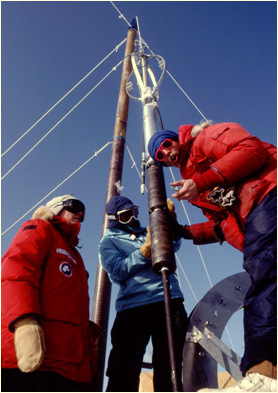 The preliminary AMANDA test string was monitored during the 1991-92 and 1992-93 seasons; this testing confirmed the expected performance of Cherenkov light detectors in ice, so that the AMANDA design and implementation could go forward. This first test of the hot water drilling scheme planned for use on AMANDA was also successful. The color photos on this page and related information are from a presentation by Albrecht Karle, "IceCube -- construction, performance, and operation" presented at the "Astrophysics at the South Pole: Status and Future Prospects" conference held in Washington, DC on 4-5 April 2011. 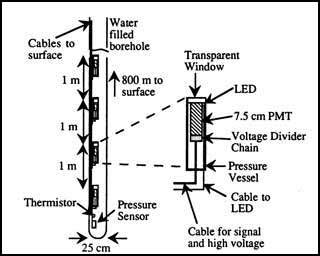 Other information, including the graphic depiction of the string, is from the paper "AMANDA: Measurement of South Pole Ice Transparency at 800 meter Depth" by T. Miller et al., presented at the 23rd International Cosmic Ray Conference, Vol. 4, held 19-30 July, 1993 at University of Calgary, Alberta, Canada. The graphic of the DUMAND OM, as well as other information about that project, is from this University of Hawaii DUMAND project informational website.